Blackie Lawless returns again under the WASP moniker, and this time he�s gone political; the album title a criticism of Washington DC. Not of the American people, Lawless is keen to point out, but of the government decisions. And you have to admit the US government are a very easy target. The album opens with 'Mercy', a fine melody of medium polished Wasp and a riff that so classic Wasp, but there�s something about the sound and the polish on the vocals that make it a little different. Same goes for 'Long, Long Way To Go', great Lawless voice, some great guitar solos, but it�s just not classic Wasp. And before you deride them, Wasp do have some classic moments, There are a few tracks from The Headless Children I absolutely adore. The ballad into to 'Take Me Up' doesn�t work, but does build up to a damn fine metal track. Good Wasp solid strong rhythm. 'The Burning Man' is another excellent track with a nod at late 80s Iron Maiden in Lawless�s own rough style. 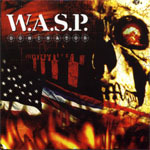 Somehow I thoroughly enjoyed this album; it�s a real mixture with highs and lows, but the highs are just not classic Wasp. Too much of a mixture, but when it comes together it REALLY comes together. Just like the A Team, I love it when a plan comes together. © 2007 Demolition Records. All rights reserved.